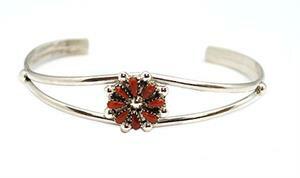 8 pettipoint coral stones in a flower design set in sterling silver and sterling split shank. Top measures just over 1/2" wide and tapers down. It is Zuni made by David Leekity. Color shade of coral may vary.